BlueScope produces a range of steels which, typically in non-marine and non-industrial environments, have enhanced weather resistance when compared to traditional steels. These steels are known as “weathering resistant steels” or “weathering steels” and are widely recognised for their distinctive “patina” which results from protective surface oxidation and develops during exposure to the atmosphere. The patina is actually a complex protective oxide layer that forms on the steel’s surface. It is this oxide layer that gives the steel its distinctive appearance as well as contributing to this material’s enhanced weather resistance capabilities compared to standard steels. If the protective oxide layer is damaged, the process of oxidation may recommence in that area until the protective layer is reformed. The improved corrosion performance can lead to improved service life and can provide a cost advantage over other materials. Weathering steels are typically used in bridges, rolling stock and shipping container applications. 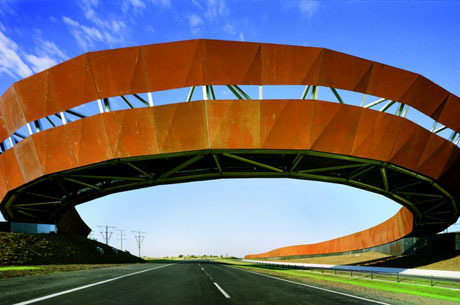 The aesthetic qualities of weathering steels have also lead to their use in architectural applications such as building facades as well as for decorative sound barriers on freeways.